Go Ahead Funding purchase order financing are great for small businesses that have purchase orders, but cannot execute due to lack of funds. Differing from traditional business lines of credit, purchase ordering financing has an easy approval process and can be set up in a short amount of time. Businesses looking for purchase order services must have purchase orders from a credible commercial client or government entity. 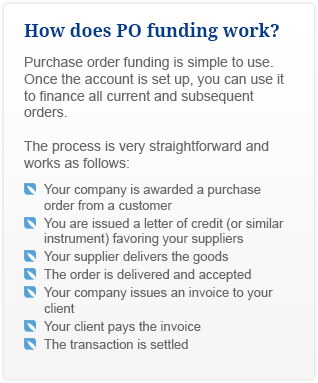 Funding for purchase orders is a financing option that allows businesses to accept all purchase orders, despite their current available capital. Purchase order financing is a great resource for companies that have depleted their available budget or other financing options. This type of financing allows businesses to fund 100 percent of supplier fees, allowing them to offer a larger volume of orders. Even more, PO financing has no autocratic limits like traditional bank finance options, and is ultimately tied to the direct sales of the business. Purchase order financing is the ideal financing for small businesses that sell third party products like resellers, distributors, or wholesalers and are rapidly expanding. If your business manufactures products or sells a service directly, rather than outsourcing, please consult our invoice factoring finance options. Contact us today at 888-454-9347 or click the Apply Now! icon for a free evaluation for the most suitable business line of credit for your company.